The mission of the International Student Competition on Cold-Formed Steel Design (CFS Design Competition) is to promote higher education in cold-formed steel structural design and to encourage students to use creative thinking skills to solve engineering problems. After the successful 2014, 2013, 2012 and 2011 competitions, the 2015 Competition is taking off again with a focus on solving a real world problem in construction. We encourage the participation of any students at any level in any major with an interest in design and learning new technologies. 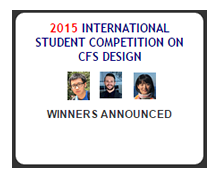 The 2015 CFS Design Competition is open to all full-time students at all levels. All student entrants are required to work on the problem individually,no team designs will be accepted. Roger A. LaBoube, Ph.D., P.E., Distinguished Teaching Professor, Missouri University of Science and Technology, US. 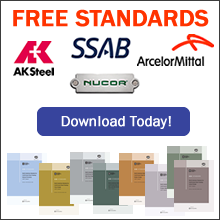 Rick Haws, P.E., NBS Group Services, A Nucor Company. Yuanqi Li, Ph.D., Professor, Tongji University, China. Yared Shifferaw Bayleyegn, Ph.D., Assistant Professor, Drexel University, US. Cheng Yu, Ph.D., Associate Professor, University of North Texas, US. September 30, 2015 - Submission deadline. All submissions shall be received electronically by 6:00 pm at student entrant's local time. November 2015 - Winners selected by the Judging Panel. December 2015 - Winners announced. January 2016 - Awards mailed to the winning students. 1st place student will receive a $600 USD monetary award and an Award plaque. 2nd place student will receive a $400 USD monetary award and an Award plaque. 3rd place student will received a $250 USD monetary award and an Award plaque. The top 25% students will receive Tier 1 Honorable Mention Recognition. All participating students will receive free CFSEI student membership. The winning designs will be recognized and exhibited at appropriate platforms such as professional conferences, websites and newsletters. 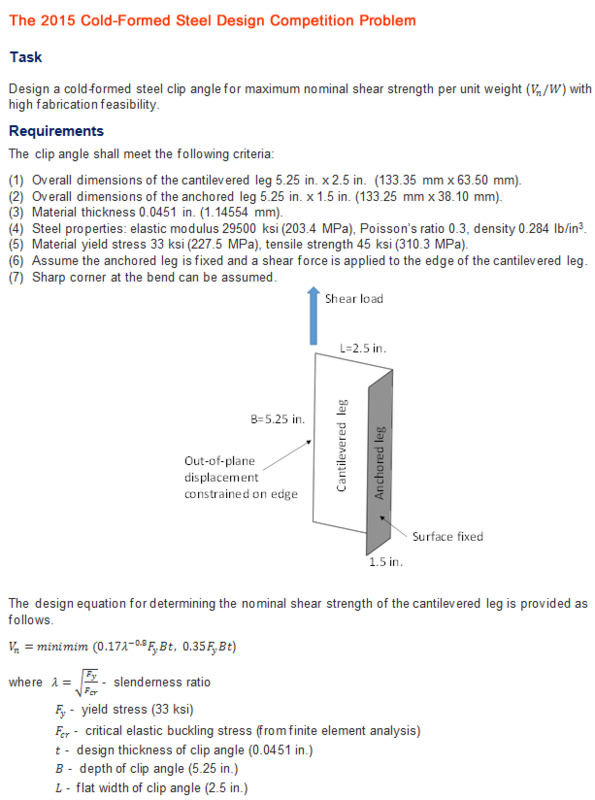 The students are allowed to use any finite element analysis tools to determine the critical elastic buckling load. A detailed design example is provided here. The design package (zipped in one file) must be submitted via email to [email protected] by 6:00pm on September 30, 2015, at student's local time. Completed the Information Form. The form can be downloaded here. A design essay (in Word or PDF). The design package (2 documents) shall be zipped to one single .zip or .rar file, and then emailed to the above address. The name of the single file shall be in the format: first name_last name.zip or first name_last name.rar. A brief essay (in English), limited to maximum 6 letter-size pages, is required as part of the design package. The essay shall describe the concept of the design, the methodology used for optimization, the finite element modeling and analysis results, and the calculation of the nominal strength. The winning designs should have a combination of high nominal shear strength per unit weight and high fabrication feasibility. The final ranking of each design will be based on the sum of 80% of its rank in unit strength and 20% of its rank in fabrication feasibility. The rank for fabrication feasibility will be decided by the judges.